Giant-Size Geek: Saturday Evening Post painted covers with Zatanna, Joker, Harley Quinn, Swamp Thing! Saturday Evening Post painted covers with Zatanna, Joker, Harley Quinn, Swamp Thing! 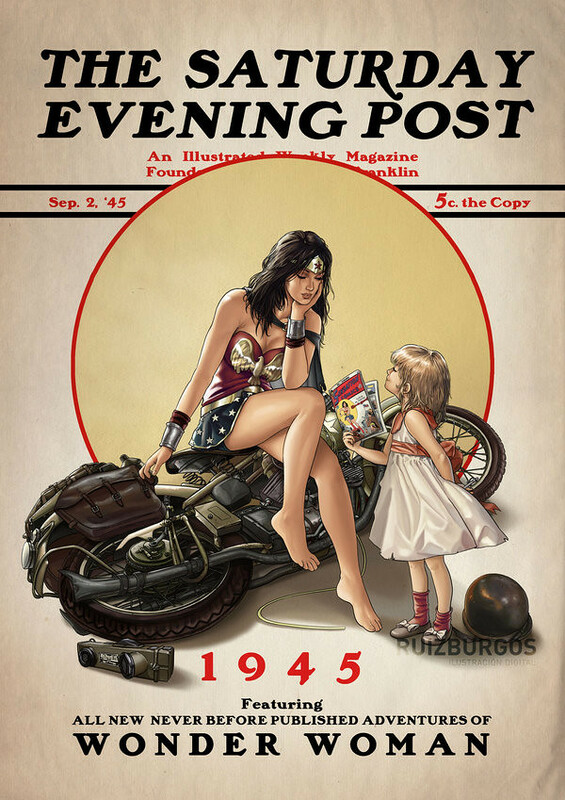 I recently discovered the work of a great illustrator, Juan Carlos Ruiz Burgos, and this fantastic series of Saturday Evening Post paintings that the did with DC Comics superheroes! Each one depicts characters in different eras from 1938 to 1971. Clark Kent in the year he first appeared, 1938. Love the Siegel and Shuster sign above the shoe sign station! 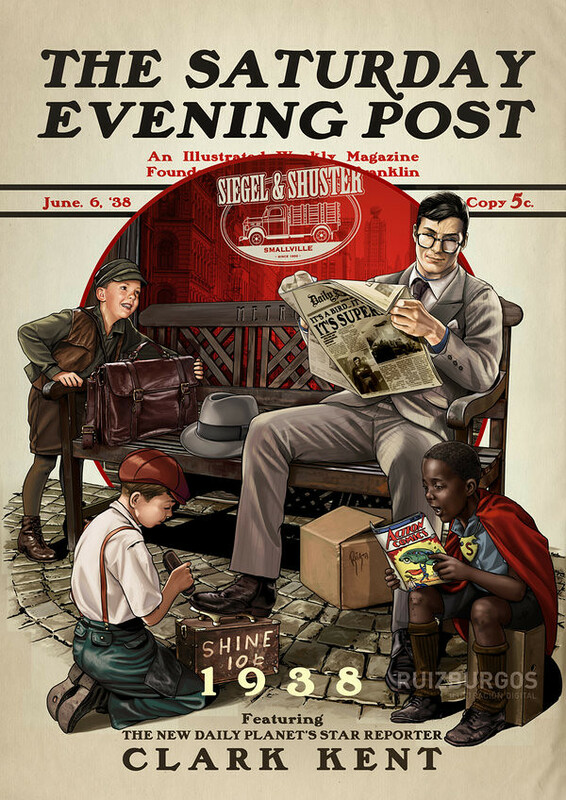 One kid is reading Action Comics #1 while Clark reads the Daily Planet with Superman on the front page. Wonder Woman in 1945. Love the little girl looking up to her with a copy of Sensation Comics #1 in her hand. 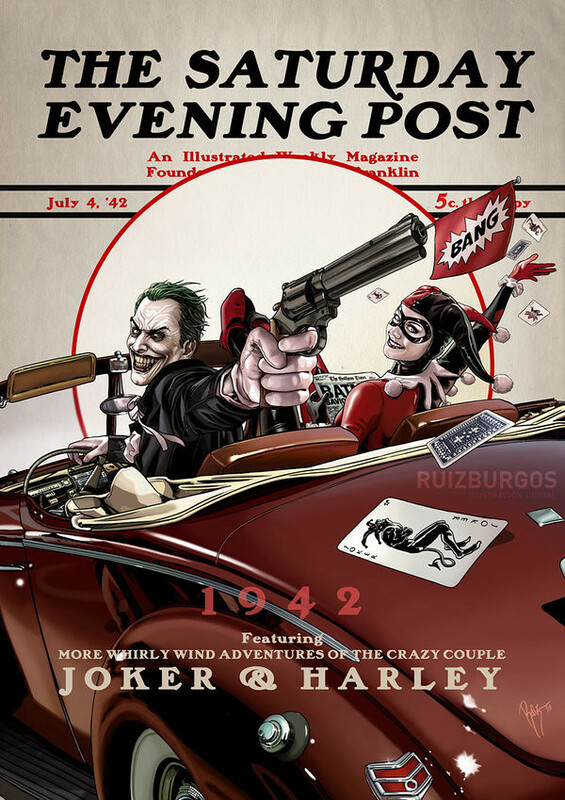 Joker and Harley Quinn in 1942, looking like Bonnie and Clyde on the run. His first appearance was 2 years earlier in Batman #1, and of course Harley came much, much later. But it's fine to imagine Harley in this time period. Catwoman getting caught on the job. Why 1989? Puzzling, but I figure that is the year the Michael Keaton Batman movie exploded into movie theaters. 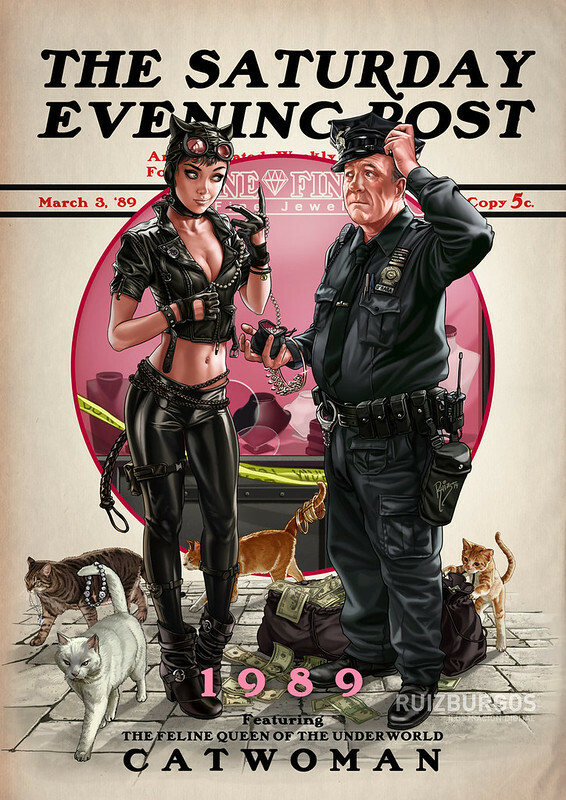 The cop arresting Selina Kyle? Chief O'Hara from the Batman 66 TV show. Zatanna with too many rabbits. Zatanna's first appearance was in Hawkman #4, 1964! Swamp Thing - my personal favorite of this entire series! Swamp Thing first appeared in House of Secrets #92 in 1971, so there is a nod to that. It's illustrated in black and white since all the classic monster movies were filmed that way. The appearance of Swampy and Abby is most decidedly in the vein of Alan Moore's take on the characters. Visit Ruiz Burgos' Deviant Art page or his blog for more great artwork. Nuff Said!